Hey, if you’ve been paying atention lately, you know that your PopCulteer is off on a wonderful trip down South to Atlanta, the land of The Walking Dead, GI Joe conventions and really cool toy shows. You may have also noticed that the posts over the last few days have been a little less wordy and a little more picture-y. That’s because PopCult is being prepared in advance. We’re cooking a whole mess of these posts up so that the mighty Gazzblog interface merely has to take them out of the freezer, warm them up and plop them on the table in front of you. There is a good chance that this blog will also be updated from the road, since we’ll be shooting tons of pictures and video while we’re doing all sorts of cool things. We just prepared these posts in advance in case we start having too much fun to do that. If everything goes as planned, you might want to check back for a mini-photo essay later today featuring images from our tour of Woodbury, the town the Governor ran in The Walking Dead. Until then, just to keep reminding you how much fun your PopCulteer is having, we lovingly present the raw press release promoting JoeLanta. We are very darned proud that our video coverage of last year’s JoeLanta was included with this press release! 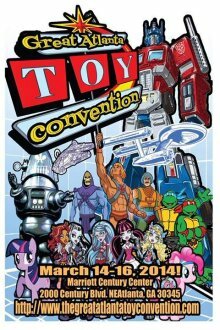 The Great Atlanta Toy Convention/JoeLanta welcome fans for two days of family fun March 15 and 16. Meet Wrestling Legends Amy “Lita” Dumas and Scott Hall and TV Psychic and Medium, Chip Coffey! 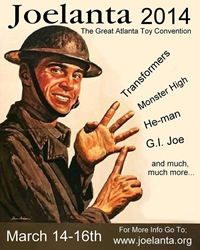 The Great Atlanta Toy Convention / JoeLanta, Atlantaʼs annual celebration of toys of all kinds, gears up for its 14th year in a big way. Celebs from film and TV, cars from the big and small screen, and oodles of toys make it an event to remember. The two-day extravaganza takes place March 15 and 16 at the Marriott Century Center Hotel in Atlanta, Ga. at Clairmont and I-85. General admission is only $6 per day! •More than 200 dealer tables featuring new and classic toys including: G.I. Joe, Barbie, Monster High, Star Wars, Transformers and many more! •Celebrity guests: Amy “Lita” Dumas (WWE Hall of Famer); Scott Hall (WWE Legend); Chip Coffey (A&Eʼs “Psychic Kids” and “Paranormal State”); Larry Zbyszko (Wrestling Legend); Tom Feister (Comic Book Artist); C. Martin Croker (Cartoon Network) and more! Get autographs from and pictures with the stars! •Pop Culture Car Show starring: The Batmobile,The General Lee, The Zombie Tactical Team S.U.V. and more! •Panels including: Behind the scenes of “The Walking Dead”; Zombie Make-Up Instruction from TV and movie make-up artist; Live Wrestling Commentary from the legends; G.I. Joeʼs 50th Anniversary and more! •HUGE Show Diorama starring 12-inch action figure in AMAZING detail! Perfect for photos! •The Annual Parachute Drop finds the hotel lobby raining with action figures each donning mini parachutes! Jaw Dropping! •Action Figure and Diorama Contests allows guests to use their imaginations to win prizes! •Family-friendly rock concert starring Radio Cult! The centerpiece of the convention remains the dealerʼs room teeming with toys. G.I. Joe figures from the ʼ60s to today and military toys inspired by the line mingle with others. Expect a slew of other toys, too. Darth Vader will likely cross swords with King Arthur. Expect Optimus Prime to be sharing shelf space with the likes of Barbie, Batman and more. The convention is brought to life by the Atlanta G.I. Joe Collectorʼs Club. Members Steve Bugg and Mike Gardner create massive, highly detailed dioramas for display at JoeLanta. The pair takes 12-inch action figures and places them in handcrafted environments. These dioramas inspired the local Joe club to create the Cody Lane Foundation. The purpose of this non-profit entity, named after a fallen soldier and fellow Atlanta collector, is to use JoeLanta profits to create a toy museum that houses these dioramas and other toys for the public to view. “It doesnʼt feel like a convention with a bunch of strangers, but one with a group of friends you havenʼt met yet,” says “G.I. Joe” comic book artist and JoeLanta guest, Tom Feister. “Itʼs an instant kinship and everybody speaks the same language.